When you start building from plans rather than kits, one of the problems you will eventually come across is the necessity to produce your own cockpit canopies. 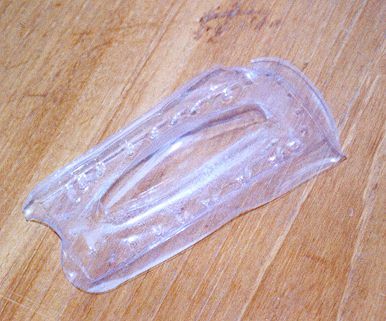 Those in kits are usually vacuum formed, but as not many of us are lucky enough to have a vac-form machine, we have to use another method. To aid those attemping a home made canopy for the first time, here is a step by step illustrated guide to the simple "plug moulding" method I use. Next we must glue a 1/8" thick plate onto the bottom of the canopy mould. 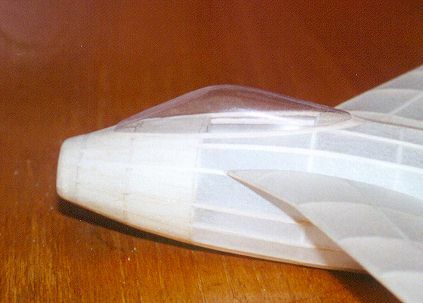 If the canopy has any vertical or steep edges that also mate with the fuselage, these need to be extended as well. 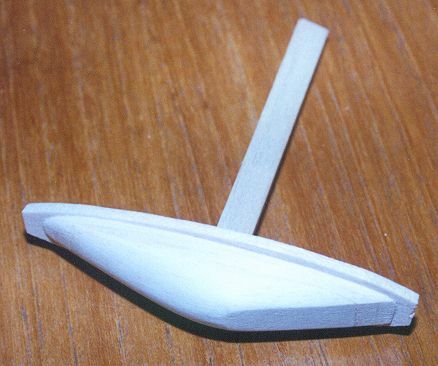 For a very steep edge on a deep canopy, you may need to add a thicker lump of balsa, and round it off towards the top, in order to stop excessive thinning of the clear sheet over the sharp corner during moulding. The addition of this extra material is important, because it ensures we have a clean, sharp edge when the canopy is trimmed. 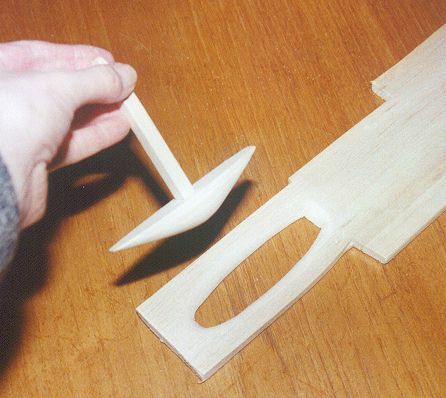 The join between the mould and the extension acts as a cutting guide when trimming. With the extra material sanded flush with the canopy form, we now need to make a simple female jig to push the mould into. This is just a hole cut in a piece of spare 3/16" or 1/4" balsa sheet, so that there is about 1/16" clearance to the male mould. 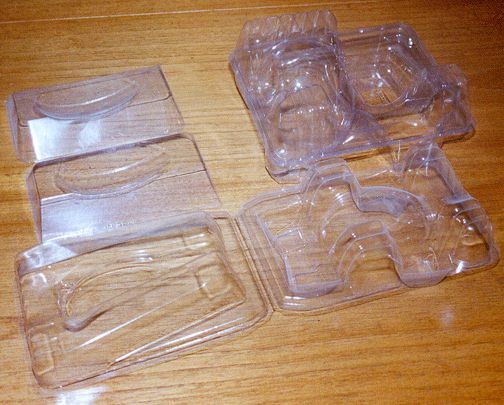 This ensures that the plastic sheet stays close to the sides of the male mould when it is pushed through. Note the entry to the hole is rounded off on one side of the sheet and smoothed to give the clear material a nice gradual lead-in. Now we need to find some plastic sheet to use for moulding. I never go out and buy material, but collect pieces of blister packaging whenever I see something that might be suitable. This is mostly PET and PVC I think, but don't quote me on that! My favourite material is vac-formed Easter egg packaging, and you can see some of my collection below (eating the contents is a necessary chore that just has to be done....) If you cut a piece to use, and place it on a tray under a grill, it will soon revert to its original flat shape. 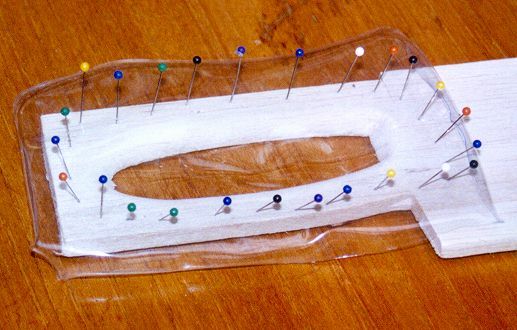 Cut a piece of sheet to generously fit over your female mould, and attach it as shown. Note the highly sophisticated (!) method used, involving lots of pins. You can use little clamps or clips if you like, but I find pins work fine. Also note that the piece of sheet is not perfectly flat - it really does not matter at all if it came off the grill pan with ripples all over it. Now for the fun part. Put on some oven gloves, and grasping the far end of the balsa sheet, hold the pinned clear sheet under the grill - you can rest it on the tray at a suitable height. Here is where trial and error come into play - you have to pick the right moment to remove the sheet. Peering under the grill, you should see the clear material tighten up, then just begin to sag a little. At the same time the first wisps of smoke may just be seen coming from it. At this stage quickly remove it and plunge the male mould into the clear sheet, through the female mould. The photo below shows how far to push it in. A couple of things can go wrong at this point. Firstly, if the sheet is not hot enough, you will not be able to push the male mould all the way in. If this is the case, then simply put it back under the grill again. The sheet will flatten out again, and you can leave it a bit longer next time. Repeat this procedure as many times as you like! If you have overheated the material, it may be discoloured, or gas bubbles may have formed inside. If so, don't heat it so much next time. In extreme cases, it may catch fire of course, so BE CAREFUL and NEVER leave it unattended under the grill. I had some sheet once that went milky when you heated it up. Some clear material just does does not work very well, in which case, bin it, and try some different stuff. You may need several attempts to get a good result, but that doesn't matter - the mould will survive quite happily. For deep drawn parts, the thickness of the sheet can be critical. Ideally you want the thinnest canopy you can get, to save weight, but a deep moulding will need a thicker sheet than a shallow one if it is not to going be so thin at the sides that it will be unusable. Some experimentation will probably be needed. These mouldings tend to be thickest at the top (where the mould first touches the plastic sheet) and thinnest at the lower sides, where the sheet gets most stretched. Remove all the pins and admire the finished canopy. The first photo below shows the canopy with mould still inside, and the second with the mould removed. The canopy is trimmed with the male mould reinserted, so you can cut through the canopy with a sharp knife into the join in the mould where the canopy block meets the extra 1/8" sheet we added earlier. Test fit the canopy to the model, and do final adjustments using nail scissors and/or emery paper. Now the canopy must be attached to the model - a process which often gives problems. I have quite a few models where smears of glue on the canopy or windscreen spoil their appearance. Add any cockpit detail and paint as required. Hold canopy in position with a couple of pieces of masking tape, or a weak rubber band or two - fiddle around until you are sure it is as perfect as possible. Retrim if necessary. 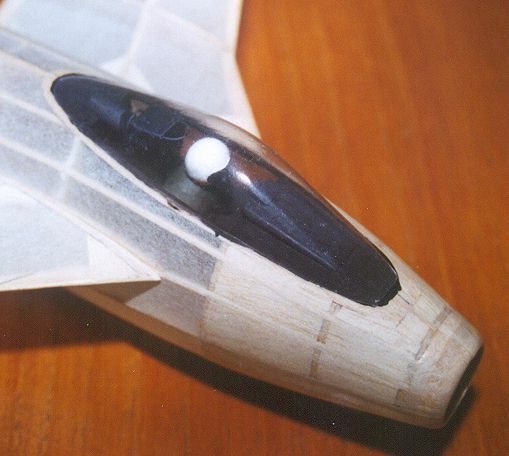 Apply a tiny bead of PVA wood glue around the canopy/fuselage join with a pin. Work round carefully, a bit at a time, and smooth the outside if necessary with your finger. 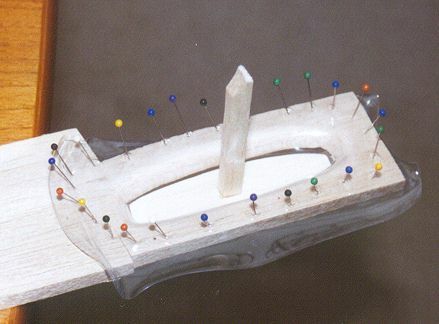 When dry, remove the tape or rubber bands, and complete the join with PVA where you couldn't reach before. Check for any gaps and fill with more PVA if you find any. 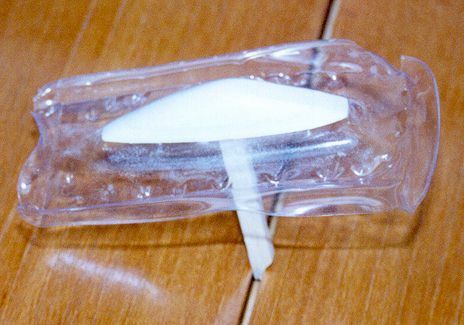 Apply a thin layer of cyano adhesive over the top of the PVA using a pin, spreading it slightly onto both the canopy and fuselage. You will be painting frames around the base of the canopy anyway, so you probably have 2 to 3mm to play with before you get into a visible clear area. The Cyano will not fog the inside of the canopy because the PVA has sealed the joint first. Below is the finished canopy glued in position on the Saab J29. When I come to paint a model, I mask off the transparent bits, leaving the framing uncovered, and spray it with the fuselage. 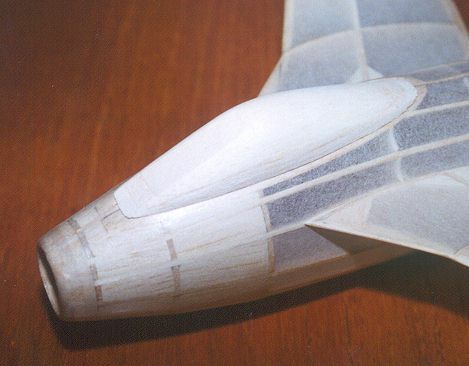 This makes the canopy seem more an integral part of the airframe, rather than having that "tacked on afterwards" look.